Multi channel retail: What’s in-store for Gen Z? Cybertill research has uncovered UK-specific detail about consumer habits of nu-wave shoppers: Gen Z. First it was the Baby Boomers, then Generation X, followed by the much-talked-about Millennials, and now Generation Z. Born between 1994 and 2010, Gen Z are fast becoming an increasingly important consumer segment in today’s market, not to be ignored or pigeonholed with Millennials. When we were looking for data about Generation Z to share with our retail customers, we noticed a considerable gap in research in the UK, with most of the information focused on the US market. 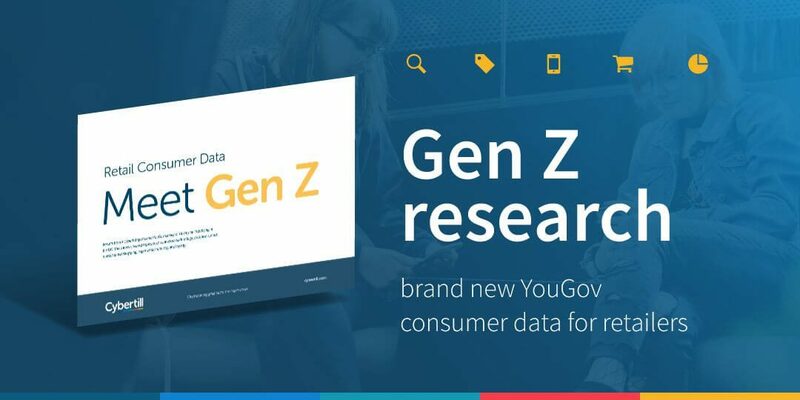 So, we decided to sponsor a YouGov survey which aimed to dig deep into the multi-channel retailing preferences of the Gen Z consumer, as well as Millennials and older generations. These 18-24 year old’s want a DIY approach to high street shopping. Focusing less on being entertained or browsing online first, than their older, Millennial counterparts (i.e. those aged 25 to 34) and more on quick, succinct, seamless experiences, in real-time, according to statistics from our YouGov report. In regards to click and collect, 59% of Gen Z would want a dedicated checkout, nearly half (48%) of Gen Z’s are frustrated with poor mobile phone signal in-store, and 45% want free wifi in-store in order to retrieve their order confirmation. Gen Z are all for the self-help in-store; not wanting to speak to shop staff and would much rather check stock themselves using retail technology. Most of Generation Z chose in-store retail technology that made them more self-sufficient whilst shopping; 38% want self-stock check points and 35% want self-check out options available in-store. This may add to the media dialogue that is often attributed to this generation as merely ‘lazy, selfish, swipe zombies insatiable in their quest for makeup tutorials and cat videos’. However, surprisingly our research also found that, although this generation does enjoy technology, nothing quite beats going in-store to physically see a product to convert them to purchase, highlighting the importance of being optimised for multi-channel retailing. Multi-channel retailing is about selling to customers through both online such as ecommerce and offline outlets, such as the high street. 76% of Gen Z voted being able to physically see product(s) in real life as their main incentive to go into store, rather than shop online. Generation Z also shared their in-store shopping frustrations in our survey. Most interesting is that a remarkable 86% said that their biggest frustration is when an item is marked ‘in-stock’ on a retailer’s website, but is not available when they go to find it in-store. Multi-channel retailing is imperative to retailers and it must be done right, with a single-view of stock and real-time epos data it will be easier for retailers to manage a seamless omnichannel experience. Multi-channel retailing is even more vital to retailers wanting to target this consumer segment who so love their mobiles! It’s important to capture the interest of Gen Z as they move between browsing in-store to buying online and vice versa. If retailers are not set up to handle multi-channel retail behaviour, they will undoubtedly be losing out on valuable sales. Gen Z also want real-time stock visibility from retail technology, so retailers, if you mark something as being ‘in stock’ in a shop location on your website, it better be there, or else face frustrated Gen Z consumers. Yet again Gen Z provided surprising results with their attitude towards experiential events. Some of the retail technology that the media has hyped as ‘must-have retail technology’ over the past 5 years or so, Gen Z are simply not interested in. Only 15% said that Beacon tech would improve their shopping experiences and only 16% liked the idea of experiential events such as VIP launches. Face-to-face personalised customer service (22%) in-store is also among the ‘media myths’ our report revealed was less important to Generation Z, compared to other features such as free samples 36%, and e-receipts 31%. Much like their Baby Boomer grandparents this generation grew up in financial instability. The market crash in 2008 has shaped much of this generation’s relationship with money and consumption. Gen Z are really not enthused by retailers offering an ’experience’ as incentive for signing up to loyalty schemes, they want discounts! 75% of Gen Z said that discounts and promotions would encourage them to sign up most, whereas points-based schemes were less preferred with only 67%. Overall, Gen Z delivered some surprising results on their preferences and frustrations when it comes to shopping. Despite expecting to see their enthusiasm for ‘experience’ and ‘retail technology’, this generation are quite straightforward in what they like and what they don’t like. They want to help themselves when browsing in store and they want fast, interaction and queue-free payments through contactless and self-checkout. Retailers may want to spend cash on experiences, VIP launches and flashy PR stunts, but that won’t impress this generation. Keep it simple, create a multi-channel, seamless shopping experience both online and in-store as this is the key to a loyal Gen Z following! Home/Resources / Multi channel retail: What’s in-store for Gen Z?